a) Put the bike on the centerstand on top of a 2" thick board. This way you can remove the wheel without removing the fender. Leave the bike in neutral so the brake disc can turn as you pull the wheel out. To prevent the bike from rocking forward off the centerstand while you're working, tie the bottom of the centerstand to the front wheel, or at least bind the front brake lever to the handlebar with a strap or something. b) Don't remove the speedo sensor. If you do, you just create another place for fluid to leak out, and another place for dirt to get in. 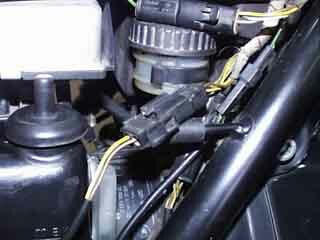 Instead, disconnect the speedo sensor at the wiring harness. c) Don't remove the shock. 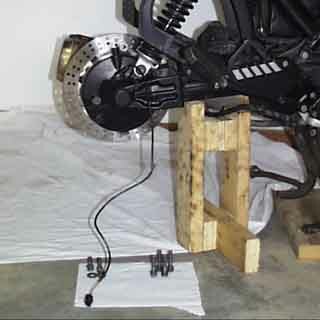 Let it support the drive while you free it from the swingarm. 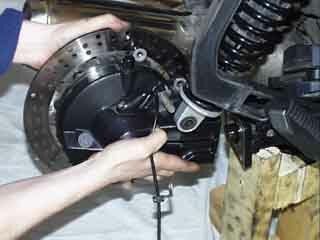 Then, when you are ready, just unhook the drive from the shock and pull it away. d) Leave a support underneath the swingarm before you remove the drive. 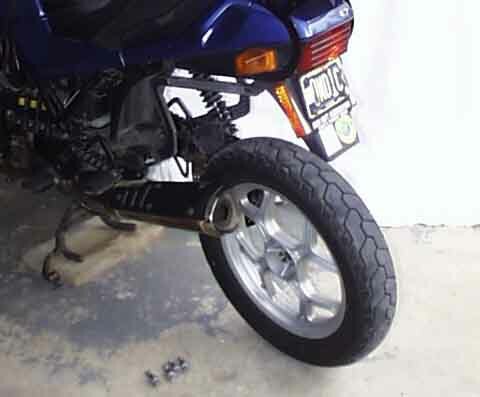 This way, once you remove the drive, the swingarm cannot drop lower than its normal position. If the swingarm drops unsupported, you will almost certainly damage the rubber swingarm boot. If the bike is on a 2" thick board, the wheel can be removed without removing the fender. It's a close fit, but it works and saves time. You will probably need a bit of help getting the bike onto the centerstand (this bike weights 600 pounds). Disconnect the speedometer sensor at the harness. You may need to cut some plastic ties to do this. Pull the metal clip off the tab on the swingarm and leave the sensor wire hanging free next to the drive. 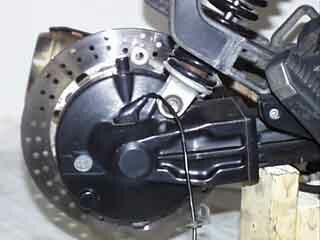 Unbolt the brake caliper from the rear drive, and leave it flopped over the swingarm. 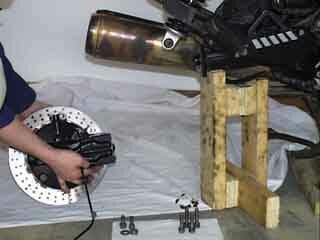 Place a support underneath the swingarm. Remove the lower shock mounting nut and washer. 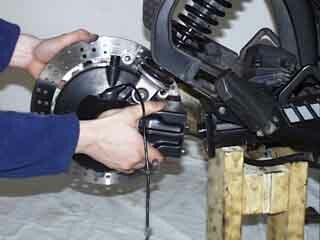 Remove the four bolts holding the final drive to the swingarm. It will remain in place, suspended by the shock. Make sure the support is properly under the swingarm so it cannot drop any lower than it already is. ...at which point the drive is totally free and can be laid down flat (on the rotor). Gear oil should not be able to leak out in this position. Reassembly is the reverse of disassembly. Hook the final drive shock mounting stud through the eye in the shock, and engage the drive spline into the end of the driveshaft. You may need to turn the rotor slightly to help the splines mesh. Position the drive so that the locating dowels engage the holes in the swingarm, and gently push so that it is fully mated to the swingarm. You may need to lightly tap it, but don't push hard or else you may push the bike off the centerstand! Once the drive is in position, you can let go because the shock will fully support it. Re-install the drive bolts, the caliper (remember the speedo cable bracket) and re-route and reconnect the cable. P.S. People have taken to calling this the "Anton Method", just so you know it wasn't my idea!